"Phytomedicine" redirects here. For the journal, see Phytomedicine (journal). Herbalism (also herbal medicine) is the study of botany and use of plants intended for medicinal purposes. Plants have been the basis for medical treatments through much of human history, and such traditional medicine is still widely practiced today. Modern medicine makes use of many plant-derived compounds as the basis for evidence-based pharmaceutical drugs. Although herbalism may apply modern standards of effectiveness testing to herbs and medicines derived from natural sources, few high-quality clinical trials and standards for purity or dosage exist. The scope of herbal medicine is sometimes extended to include fungal and bee products, as well as minerals, shells and certain animal parts. Herbal medicine may also refer to phytomedicine, phytotherapy, or paraherbalism, which are alternative and pseudoscientific practices of using unrefined plant or animal extracts as supposed medicines or health-promoting agents. Phytotherapy differs from plant-derived medicines in standard pharmacology because it does not isolate or standardize biologically active compounds, but rather relies on the false belief that preserving various substances from a given source with less processing is safer or more effective — for which there is no evidence. Herbal dietary supplements most often fall under the phytotherapy category. Archaeological evidence indicates that the use of medicinal plants dates back to the Paleolithic age, approximately 60,000 years ago. Written evidence of herbal remedies dates back over 5,000 years to the Sumerians, who compiled lists of plants. Some ancient cultures wrote about plants and their medical uses in books called herbals. In ancient Egypt, herbs are mentioned in Egyptian medical papyri, depicted in tomb illustrations, or on rare occasions found in medical jars containing trace amounts of herbs. Among the oldest, lengthiest, and most important medical papyri of ancient Egypt, the Ebers Papyrus dates from about 1550 BC, and covers more than 700 compounds, mainly of plant origin. The earliest known Greek herbals came from Theophrastus of Eresos who, in the 4th century BC, wrote in Greek Historia Plantarum, from Diocles of Carystus who wrote during the 3rd century BC, and from Krateuas who wrote in the 1st century BC. Only a few fragments of these works have survived intact, but from what remains, scholars noted overlap with the Egyptian herbals. Seeds likely used for herbalism were found in archaeological sites of Bronze Age China dating from the Shang Dynasty (c. 1600–1046 BC). Over a hundred of the 224 compounds mentioned in the Huangdi Neijing, an early Chinese medical text, are herbs. Herbs also commonly featured in the traditional medicine of ancient India, where the principal treatment for diseases was diet. De Materia Medica, originally written in Greek by Pedanius Dioscorides (c. 40–90 AD) of Anazarbus, Cilicia, a Greek physician, pharmacologist and botanist, is one example of herbal writing which was used for 1500 years until the 1600s. The World Health Organization (WHO) estimates that 80 percent of the population of some Asian and African countries presently use herbal medicine for some aspect of primary health care. Pharmaceuticals are prohibitively expensive for most of the world's population, half of whom lived on less than $2 U.S. per day in 2002. In comparison, herbal medicines can be grown from seed or gathered from nature for little or no cost. In a 2010 global survey of the most common 1000 plant-derived compounds, 156 had clinical trials published. Preclinical studies (cell culture and animal studies) were reported for about one-half of the plant products, while 120 (12%) of the plants evaluated – although available in the Western market – had no rigorous studies of their properties, and five were toxic or allergenic, a finding that led the authors to conclude "their use ought to be discouraged or forbidden." Nine plants evaluated in human clinical research included Althaea officinalis (marshmallow), Calendula officinalis (marigold), Centella asiatica (centella), Echinacea purpurea (echinacea), Passiflora incarnata (passionflower), Punica granatum (pomegranate), Vaccinium macrocarpon (cranberry), Vaccinium myrtillus (bilberry), and Valeriana officinalis (valerian), although generally there were inconsistent, often negative results, and the studies were of low quality. In 2015, the Australian Government's Department of Health published the results of a review of alternative therapies that sought to determine if any were suitable for being covered by health insurance; Herbalism was one of 17 topics evaluated for which no clear evidence of effectiveness was found. Establishing guidelines to assess safety and efficacy of herbal products, the European Medicines Agency provides criteria for evaluating and grading the quality of clinical research in preparing monographs about herbal products. In the United States, the National Center for Complementary and Integrative Health of the National Institutes of Health funds clinical trials on herbal compounds, provides fact sheets evaluating the safety, potential effectiveness and side effects of many plant sources, and maintains a registry of clinical research conducted on herbal products. According to Cancer Research UK as of 2015, "there is currently no strong evidence from studies in people that herbal remedies can treat, prevent or cure cancer". Herbal teas, or tisanes, are the resultant liquid of extracting herbs into water, though they are made in a few different ways. Infusions are hot water extracts of herbs, such as chamomile or mint, through steeping. Decoctions are the long-term boiled extracts, usually of harder substances like roots or bark. Maceration is the cold infusion of plants with high mucilage-content, such as sage or thyme. To make macerates, plants are chopped and added to cold water. They are then left to stand for 7 to 12 hours (depending on herb used). For most macerates, 10 hours is used. Tinctures are alcoholic extracts of herbs, which are generally stronger than herbal teas. Tinctures are usually obtained by combining 100% pure ethanol (or a mixture of 100% ethanol with water) with the herb. A completed tincture has an ethanol percentage of at least 25% (sometimes up to 90%). Herbal wine and elixirs are alcoholic extract of herbs, usually with an ethanol percentage of 12–38%. Extracts include liquid extracts, dry extracts, and nebulisates. Liquid extracts are liquids with a lower ethanol percentage than tinctures. They are usually made by vacuum distilling tinctures. Dry extracts are extracts of plant material that are evaporated into a dry mass. They can then be further refined to a capsule or tablet. For partial list of herbs with known adverse effects, see List of herbs with known adverse effects. 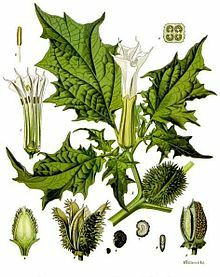 Datura stramonium has been used in Ayurveda for various treatments, but contains alkaloids, such as atropine and scopolamine, which may cause severe toxicity. A number of herbs are thought to be likely to cause adverse effects. Furthermore, "adulteration, inappropriate formulation, or lack of understanding of plant and drug interactions have led to adverse reactions that are sometimes life threatening or lethal." Proper double-blind clinical trials are needed to determine the safety and efficacy of each plant before they can be recommended for medical use. Although many consumers believe that herbal medicines are safe because they are "natural", herbal medicines and synthetic drugs may interact, causing toxicity to the patient. Herbal remedies can also be dangerously contaminated, and herbal medicines without established efficacy, may unknowingly be used to replace medicines that do have corroborated efficacy. Standardization of purity and dosage is not mandated in the United States, but even products made to the same specification may differ as a result of biochemical variations within a species of plant. Plants have chemical defense mechanisms against predators that can have adverse or lethal effects on humans. Examples of highly toxic herbs include poison hemlock and nightshade. They are not marketed to the public as herbs, because the risks are well known, partly due to a long and colorful history in Europe, associated with "sorcery", "magic" and intrigue. Although not frequent, adverse reactions have been reported for herbs in widespread use. On occasion serious untoward outcomes have been linked to herb consumption. A case of major potassium depletion has been attributed to chronic licorice ingestion., and consequently professional herbalists avoid the use of licorice where they recognize that this may be a risk. Black cohosh has been implicated in a case of liver failure. Few studies are available on the safety of herbs for pregnant women, and one study found that use of complementary and alternative medicines are associated with a 30% lower ongoing pregnancy and live birth rate during fertility treatment. Examples of herbal treatments with likely cause-effect relationships with adverse events include aconite, which is often a legally restricted herb, ayurvedic remedies, broom, chaparral, Chinese herb mixtures, comfrey, herbs containing certain flavonoids, germander, guar gum, liquorice root, and pennyroyal. Examples of herbs where a high degree of confidence of a risk long term adverse effects can be asserted include ginseng, which is unpopular among herbalists for this reason, the endangered herb goldenseal, milk thistle, senna, against which herbalists generally advise and rarely use, aloe vera juice, buckthorn bark and berry, cascara sagrada bark, saw palmetto, valerian, kava, which is banned in the European Union, St. John's wort, Khat, Betel nut, the restricted herb Ephedra, and Guarana. There is also concern with respect to the numerous well-established interactions of herbs and drugs. In consultation with a physician, usage of herbal remedies should be clarified, as some herbal remedies have the potential to cause adverse drug interactions when used in combination with various prescription and over-the-counter pharmaceuticals, just as a patient should inform a herbalist of their consumption of orthodox prescription and other medication. For example, dangerously low blood pressure may result from the combination of an herbal remedy that lowers blood pressure together with prescription medicine that has the same effect. Some herbs may amplify the effects of anticoagulants. Certain herbs as well as common fruit interfere with cytochrome P450, an enzyme critical to much drug metabolism. In a 2018 study, FDA identified active pharmaceutical additives in over 700 of analyzed dietary supplements sold as "herbal", "natural" or "traditional". The undisclosed additives included "unapproved antidepressants and designer steroids", as well as prescription drugs, such as sildenafil or sibutramine. A 2013 study found that one-third of herbal supplements sampled contained no trace of the herb listed on the label. The study found products adulterated with contaminants or fillers not listed on the label, including potential allergens such as soy, wheat, or black walnut. One bottle labeled as St. John's Wort was found to actually contain Alexandrian senna, a laxative. Researchers at the University of Adelaide found in 2014 that almost 20 per cent of herbal remedies surveyed were not registered with the Therapeutic Goods Administration, despite this being a condition for their sale. They also found that nearly 60 per cent of products surveyed had ingredients that did not match what was on the label. Out of 121 products, only 15 had ingredients that matched their TGA listing and packaging. In 2015, the New York Attorney General issued cease and desist letters to four major U.S. retailers (GNC, Target, Walgreens, and Walmart) who were accused of selling herbal supplements that were mislabeled and potentially dangerous. Twenty-four products were tested by DNA barcoding as part of the investigation, with all but five containing DNA that did not match the product labels. In some countries, formalized training and minimum education standards exist, although these are not necessarily uniform within or between countries. In Australia, for example, the self-regulated status of the profession (as of 2009) resulted in variable standards of training, and numerous loosely-formed associations setting different educational standards. One 2009 review concluded that regulation of herbalists in Australia was needed to reduce the risk of interaction of herbal medicines with prescription drugs, to implement clinical guidelines and prescription of herbal products, and to assure self-regulation for protection of public health and safety. In the United Kingdom, the training of herbalists is done by state funded universities offering Bachelor of Science degrees in herbal medicine. The World Health Organization (WHO), the specialized agency of the United Nations (UN) that is concerned with international public health, published Quality control methods for medicinal plant materials in 1998 in order to support WHO Member States in establishing quality standards and specifications for herbal materials, within the overall context of quality assurance and control of herbal medicines. In the European Union (EU), herbal medicines are regulated under the Committee on Herbal Medicinal Products. In the United States, herbal remedies are regulated dietary supplements by the Food and Drug Administration (FDA) under current good manufacturing practice (cGMP) policy for dietary supplements. Manufacturers of products falling into this category are not required to prove the safety or efficacy of their product so long as they do not make 'medical' claims or imply uses other than as a 'dietary supplement', though the FDA may withdraw a product from sale should it prove harmful. Canadian regulations are described by the Natural and Non-prescription Health Products Directorate which requires an eight-digit Natural Product Number or Homeopathic Medicine Number on the label of licensed herbal medicines or dietary supplements. Some herbs, such as cannabis and coca, are outright banned in most countries though coca is legal in most of the South American countries where it is grown. The Cannabis plant is used as an herbal medicine, and as such is legal in some parts of the world. Since 2004, the sales of ephedra as a dietary supplement is prohibited in the United States by the FDA, and subject to Schedule III restrictions in the United Kingdom. Herbalism has been criticized as a potential "minefield" of unreliable product quality, safety hazards, and potential for misleading health advice. Globally, there are no standards across various herbal products to authenticate their contents, safety or efficacy, and there is generally an absence of high-quality scientific research on product composition or effectiveness for anti-disease activity. Presumed claims of therapeutic benefit from herbal products, without rigorous evidence of efficacy and safety, receive skeptical views by scientists. Unethical practices by some herbalists and manufacturers, which may include false advertising about health benefits on product labels or literature, and contamination or use of fillers during product preparation, may erode consumer confidence about services and products. An example of a herbal medicine resource: the bark of the cinchona tree contains quinine, which today is a widely prescribed treatment for malaria. The unpurified bark is still used by some who can not afford to purchase more expensive antimalarial drugs. Paraherbalism or phytotherapy is the pseudoscientific use of extracts of plant or animal origin as supposed medicines or health-promoting agents. Phytotherapy differs from plant-derived medicines in standard pharmacology because it does not isolate and standardize the compounds from a given plant believed to be biologically active. It relies on the false belief that preserving the complexity of substances from a given plant with less processing is safer and potentially more effective, for which there is no evidence either condition applies. Phytochemical researcher Varro Eugene Tyler described paraherbalism as "faulty or inferior herbalism based on pseudoscience", using scientific terminology but lacking scientific evidence for safety and efficacy. Tyler listed ten fallacies that distinguished herbalism from paraherbalism, including claims that there is a conspiracy to suppress safe and effective herbs, herbs can not cause harm, that whole herbs are more effective than molecules isolated from the plants, herbs are superior to drugs, the doctrine of signatures (the belief that the shape of the plant indicates its function) is valid, dilution of substances increases their potency (a doctrine of the pseudoscience of homeopathy), astrological alignments are significant, animal testing is not appropriate to indicate human effects, anecdotal evidence is an effective means of proving a substance works and herbs were created by God to cure disease. Tyler suggests that none of these beliefs have any basis in fact. Ready to drink macerated medicinal liquor with goji berry, tokay gecko, and ginseng, for sale at a traditional medicine market in Xi'an, China. Up to 80% of the population in Africa uses traditional medicine as primary health care. Some researchers trained in both Western and traditional Chinese medicine have attempted to deconstruct ancient medical texts in the light of modern science. One idea is that the yin-yang balance, at least with regard to herbs, corresponds to the pro-oxidant and anti-oxidant balance. This interpretation is supported by several investigations of the ORAC ratings of various yin and yang herbs. In India, Ayurvedic medicine has quite complex formulas with 30 or more ingredients, including a sizable number of ingredients that have undergone "alchemical processing", chosen to balance dosha. In Ladakh, Lahul-Spiti and Tibet, the Tibetan Medical System is prevalent, also called the 'Amichi Medical System'. Over 337 species of medicinal plants have been documented by C.P. Kala. Those are used by Amchis, the practitioners of this medical system. In Tamil Nadu, Tamils have their own medicinal system now popularly called Siddha medicine. The Siddha system is entirely in the Tamil language. It contains roughly 300,000 verses covering diverse aspects of medicine. This work includes herbal, mineral and metallic compositions used as medicine. Ayurveda is in Sanskrit, but Sanskrit was not generally used as a mother tongue and hence its medicines are mostly taken from Siddha and other local traditions. Different types of Indonesian jamu herbal medicines held in bottles. In Indonesia, especially among the Javanese, the jamu traditional herbal medicine is an age old tradition preserved for centuries. Jamu is thought to have originated in the Mataram Kingdom era, some 1300 years ago. The bas-reliefs on Borobudur depict the image of people grinding herbs with stone mortar and pestle, a drink seller, a physician and masseuse treating their clients. All of these scenes might be interpreted as a traditional herbal medicine and health-related treatments in ancient Java. The Madhawapura inscription from Majapahit period mentioned a specific profession of herbs mixer and combiner (herbalist), called Acaraki. The medicine book from Mataram dated from circa 1700 contains 3,000 entries of jamu herbal recipes, while Javanese classical literature Serat Centhini (1814) describes some jamu herbal concoction recipes. Though possibly influenced by Indian Ayurveda systems, Indonesia's vast archipelago holds numerous indigenous plants not to be found in India, including plants similar to those in Australia beyond the Wallace Line. Jamu practices may vary from region to region, and are often not written down, especially in remote areas of the country. Although primarily herbal, some Jamu materials are acquired from animals, such as honey, royal jelly, milk and ayam kampung eggs. Herbalists tend to use extracts from parts of plants, such as the roots or leaves, believing that plants are subject to environmental pressures and therefore develop resistance to threats such as radiation, reactive oxygen species and microbial attack in order to survive, providing defensive phytochemicals of use in herbalism. Indigenous healers often claim to have learned by observing that sick animals change their food preferences to nibble at bitter herbs they would normally reject. Field biologists have provided corroborating evidence based on observation of diverse species, such as chickens, sheep, butterflies, and chimpanzee. The habit[which?] has been shown to be a physical means of purging intestinal parasites. Lowland gorillas take 90%[verification needed] of their diet from the fruits of Aframomum melegueta, a relative of the ginger plant, that is a potent antimicrobial and apparently keeps shigellosis and similar infections at bay. Current research focuses on the possibility that this plant also protects gorillas from fibrosing cardiomyopathy, which has a devastating effect on captive animals. Sick animals tend to forage plants rich in secondary metabolites, such as tannins and alkaloids. Because these phytochemicals often have antiviral, antibacterial, antifungal, and antihelminthic properties, a plausible case can be made for self-medication by animals in the wild. ^ a b c d e "Hard to swallow". Nature. 448 (7150): 105–06. 2007. Bibcode:2007Natur.448S.105.. doi:10.1038/448106a. PMID 17625521. ^ a b Lack, Caleb W.; Rousseau, Jacques (2016). Critical Thinking, Science, and Pseudoscience: Why We Can't Trust Our Brains. Springer Publishing Company. pp. 212–214. ISBN 9780826194268. ^ a b "Herbal medicine". Cancer Research UK. 2 February 2015. Retrieved 12 November 2018. ^ a b c d e Varro E. Tyler (31 August 1999). "False Tenets of Paraherbalism". Quackwatch. Retrieved 29 October 2016. ^ a b c d e Barrett, Stephen (23 November 2013). "The herbal minefield". Quackwatch. Retrieved 25 February 2017. ^ "The Herbal Minefield". www.quackwatch.org. Retrieved 25 July 2018. ^ Nunn, John (2002). Ancient Egyptian Medicine. University of Oklahoma Press. p. 151. ISBN 978-0-8061-3504-5. ^ Atanasov AG, Waltenberger B, Pferschy-Wenzig EM, Linder T, Wawrosch C, Uhrin P, Temml V, Wang L, Schwaiger S, Heiss EH, Rollinger JM, Schuster D, Breuss JM, Bochkov V, Mihovilovic MD, Kopp B, Bauer R, Dirsch VM, Stuppner H (2015). "Discovery and resupply of pharmacologically active plant-derived natural products: A review". Biotechnol. Adv. 33 (8): 1582–614. doi:10.1016/j.biotechadv.2015.08.001. PMC 4748402. PMID 26281720. ^ Robson, Barry & Baek, OK (2009). The Engines of Hippocrates: From the Dawn of Medicine to Medical and Pharmaceutical Informatics. John Wiley & Sons. p. 50. ISBN 9780470289532. ^ Hong, Francis (2004). "History of Medicine in China" (PDF). McGill Journal of Medicine. 8 (1): 7984. Archived from the original (PDF) on 1 December 2013. ^ Unschuld, Pual (2003). Huang Di Nei Jing: Nature, Knowledge, Imagery in an Ancient Chinese Medical Text. University of California Press. p. 286. ISBN 978-0-520-92849-7. ^ Ackerknecht, Erwin (1982). A Short History of Medicine. JHU Press. p. 39. ISBN 978-0-8018-2726-6. ^ The Classical Tradition. Harvard University Press. 2010. p. 146. ISBN 978-0-674-03572-0. ^ a b "Traditional medicine". Archived from the original on 28 July 2008. ^ Edgar J. DaSilva; Elias Baydoun; Adnan Badran (2002). "Biotechnology and the developing world". Electronic Journal of Biotechnology. 5 (1). doi:10.2225/vol5-issue1-fulltext-1. ISSN 0717-3458. ^ Interactive European Network for Industrial Crops and their Applications (2000–2005). "Summary Report for the European Union". QLK5-CT-2000-00111. Archived from the original on 22 December 2013. [www.ienica.net/reports/ienicafinalsummaryreport2000-2005.pdf Free full-text]. ^ Fabricant DS, Farnsworth NR (March 2001). "The value of plants used in traditional medicine for drug discovery". Environ. Health Perspect. 109 Suppl 1 (Suppl 1): 69–75. doi:10.1289/ehp.01109s169. PMC 1240543. PMID 11250806. ^ a b c Cravotto G, Boffa L, Genzini L, Garella D (February 2010). "Phytotherapeutics: an evaluation of the potential of 1000 plants". J Clin Pharm Ther. 35 (1): 11–48. doi:10.1111/j.1365-2710.2009.01096.x. PMID 20175810. ^ "Assessment of clinical safety and efficacy in the preparation of Community herbal monographs for well-established and of Community herbal monographs/entries to the Community list for traditional herbal medicinal products/substances/preparations". European Medicines Agency. 2017. Retrieved 25 February 2017. ^ "Herbs at a Glance". National Center for Complementary and Integrative Health, US National Institutes of Health. 21 November 2016. Retrieved 24 February 2017. ^ "Clinicaltrials.gov, a registry of studies on herbal medicine". Clinicaltrials.gov, US National Institutes of Health. 2017. Retrieved 25 February 2017. ^ Burstein, HJ; Gelber, S; Guadagnoli, E; Weeks, JC (June 1999). "Use of alternative medicine by women with early-stage breast cancer". N Engl J Med. 340 (22): 1733–39. doi:10.1056/NEJM199906033402206. PMID 10352166. ^ Egede, LE; Ye, X; Zheng, D; Silverstein, MD (February 2002). "The prevalence and pattern of complementary and alternative medicine use in individuals with diabetes". Diabetes Care. 25 (2): 324–29. doi:10.2337/diacare.25.2.324. PMID 11815504. ^ Roozbeh, J; Hashempur, MH; Heydari, M (November 2013). "Use of herbal remedies among patients undergoing hemodialysis". Iran J Kidney Dis. 7 (6): 492–95. PMID 24241097. ^ Bishop, FL; Lewith, GT (March 2010). "Who Uses CAM? A Narrative Review of Demographic Characteristics and Health Factors Associated with CAM Use". Evid Based Complement Alternat Med. 7 (1): 11–28. doi:10.1093/ecam/nen023. PMC 2816378. PMID 18955327. ^ Complementary and alternative medicine (CAM) is a combination of medical and health care systems, practices, and products that are not presently considered to be part of conventional medicine. ^ James A. Duke (December 1999 – January 2000). "Returning to our Medicinal Roots". Mother Earth News: 26–33. Archived from the original on 5 November 2012. ^ Kala, Chandra Prakash; Sajwan (2007). "Revitalizing Indian systems of herbal medicine by the National Medicinal Plants Board through institutional networking and capacity building". Current Science. 93 (6): 797–806. ^ a b Saad, Bashar & Said, Omar (2011). Greco-Arab and Islamic Herbal Medicine: Traditional System, Ethics, Safety, Efficacy, and Regulatory Issues. John Wiley & Sons. p. 80. ISBN 9780470474211. ^ "What is Herb Standardization?". HerbalGram. (52): 25. 2001. ^ Green, James (2000). The Herbal Medicine Maker's Handbook: A Home Manual. Chelsea Green Publishing. p. 168. ISBN 9780895949905. ^ a b Odinsson, Eoghan (2010). Northern Lore: A Field Guide to the Northern Mind-Body-Spirit. ISBN 978-1452851433. ^ "Aromatherapy". University of Maryland Medical Center. 2017. ^ Herz RS (2009). "Aroma therapy facts and fiction: a scientific analysis". Int J Neurosci. 119 (2): 263–290. doi:10.1080/00207450802333953. PMID 19125379. ^ Gilani AH, Shah AJ, Zubair A, Khalid S, Kiani J, Ahmed A, Rasheed M, Ahmad V (2009). "Chemical composition and mechanisms underlying the spasmolytic and bronchodilatory properties of the essential oil of Nepeta cataria L". J Ethnopharmacol. 121 (3): 405–11. doi:10.1016/j.jep.2008.11.004. PMID 19041706. ^ Gaire, BP; Subedi, L (2013). "A review on the pharmacological and toxicological aspects of Datura stramonium L". Journal of Integrative Medicine. 11 (2): 73–79. doi:10.3736/jintegrmed2013016. PMID 23506688. ^ Talalay, P; Talalay, P (2001). "The importance of using scientific principles in the development of medicinal agents from plants". Academic Medicine. 76 (3): 238–47. doi:10.1097/00001888-200103000-00010. PMID 11242573. ^ a b c Elvin-Lewis M (2001). "Should we be concerned about herbal remedies". Journal of Ethnopharmacology. 75 (2–3): 141–64. doi:10.1016/S0378-8741(00)00394-9. PMID 11297844. ^ Vickers AJ (2007). "Which botanicals or other unconventional anticancer agents should we take to clinical trial?". J Soc Integr Oncol. 5 (3): 125–29. doi:10.2310/7200.2007.011. PMC 2590766. PMID 17761132. ^ Ernst E (2007). Herbal medicines: balancing benefits and risks. Novartis Found. Symp. Novartis Foundation Symposia. 282. pp. 154–67, discussion 167–72, 212–18. doi:10.1002/9780470319444.ch11. ISBN 978-0-470-31944-4. PMID 17913230. ^ a b c d e Newmaster, SG; Grguric, M; Shanmughanandhan, D; Ramalingam, S; Ragupathy, S (2013). "DNA barcoding detects contamination and substitution in North American herbal products". BMC Medicine. 11: 222. doi:10.1186/1741-7015-11-222. PMC 3851815. PMID 24120035. ^ Müller, JL (1998). "Love potions and the ointment of witches: historical aspects of the nightshade alkaloids". J Toxicol Clin Toxicol. 36 (6): 617–27. doi:10.3109/15563659809028060. PMID 9776969. ^ Lee, MR (December 2006). "Solanaceae III: henbane, hags and Hawley Harvey Crippen". J R Coll Physicians Edinb. 36 (4): 366–73. PMID 17526134. ^ Pinn, G (November 2001). "Adverse effects associated with herbal medicine". Aust Fam Physician. 30 (11): 1070–75. PMID 11759460. ^ Lin, Shih-Hua; Yang, SS; Chau, T; Halperin, ML (March 2003). "An unusual cause of hypokalemic paralysis: chronic licorice ingestion". Am J Med Sci. 325 (3): 153–56. doi:10.1097/00000441-200303000-00008. PMID 12640291. ^ Lynch, Christopher R.; Folkers, ME; Hutson, WR (June 2006). "Fulminant hepatic failure associated with the use of black cohosh: a case report". Liver Transpl. 12 (6): 989–92. doi:10.1002/lt.20778. PMID 16721764. ^ Born, D; Barron, ML (May – June 2005). "Herb use in pregnancy: what nurses should know". MCN Am J Matern Child Nurs. 30 (3): 201–06. doi:10.1097/00005721-200505000-00009. PMID 15867682. ^ Boivin J, Schmidt L (2009). "Use of complementary and alternative medicines associated with a 30% lower onging pregnancy/live birth rate during 12 months of fertility treatment". Human Reproduction. 24 (7): 1626–31. doi:10.1093/humrep/dep077. PMID 19359338. ^ Ernst E (1998). "Harmless Herbs? A Review of the Recent Literature" (PDF). The American Journal of Medicine. 104 (2): 170–78. doi:10.1016/S0002-9343(97)00397-5. PMID 9528737. Retrieved 27 December 2010. ^ Spolarich, AE; Andrews, L (Summer 2007). "An examination of the bleeding complications associated with herbal supplements, antiplatelet and anticoagulant medications". J Dent Hyg. 81 (3): 67. PMID 17908423. ^ Nekvindová, J; Anzenbacher, P (July 2007). "Interactions of food and dietary supplements with drug metabolising cytochrome P450 enzymes". Ceska Slov Farm. 56 (4): 165–73. PMID 17969314. ^ Ronnie Cohen (12 October 2018). "No Wonder It Works So Well: There May Be Viagra In That Herbal Supplement". NPR.org. Retrieved 13 October 2018. ^ O'Connor, Anahad (3 November 2012). "Herbal Supplements Are Often Not What They Seem". New York Times. Retrieved 12 November 2013. ^ a b Carroll, Lucy (24 February 2014). "Herbal medicines: Study raises alarm over labelling". The Sydney Morning Herald, Australia. Retrieved 25 February 2017. ^ O'Connor, Anahad (3 February 2015). "New York Attorney General Targets Supplements at Major Retailers". New York Times. Retrieved 3 February 2015. ^ Kaplan, Sarah (3 February 2015). "GNC, Target, Wal-Mart, Walgreens accused of selling adulterated 'herbals'". Washington Post. Retrieved 3 February 2015. ^ a b Lin, V.; McCabe, P.; Bensoussan, A.; Myers, S.; Cohen, M.; Hill, S.; Howse, G. (2009). "The practice and regulatory requirements of naturopathy and western herbal medicine in Australia". Risk Management and Healthcare Policy. 2: 21–33. doi:10.2147/RMHP.S4652. PMC 3270908. PMID 22312205. ^ "WHO Quality Control Methods for Herbal Materials" (PDF). World Health Organization, Geneva, Switzerland. 2011. ^ "Herbal medicinal products". European Medicines Agency. 2017. Retrieved 25 February 2017. ^ "Botanical Dietary Supplements". Office of Dietary Supplements, US National Institutes of Health. June 2011. Retrieved 25 February 2017. ^ "Licensed Natural Health Products Database: What is it?". Health Canada. 8 December 2016. Retrieved 25 February 2017. ^ "WHO Traditional Medicine Strategy, 2014–2023" (PDF). World Health Organization. 2013. p. 41. Retrieved 25 February 2017. ^ Zhang, J; Wider, B; Shang, H; Li, X; Ernst, E (2012). "Quality of herbal medicines: Challenges and solutions". Complementary Therapies in Medicine. 20 (1–2): 100–6. doi:10.1016/j.ctim.2011.09.004. PMID 22305255. ^ Morris, CA; Avorn, J (2003). "Internet marketing of herbal products". JAMA. 290 (11): 1505–09. doi:10.1001/jama.290.11.1505. PMID 13129992. ^ Coghlan, ML; Haile, J; Houston, J; Murray, DC; White, NE; Moolhuijzen, P; Bellgard, MI; Bunce, M (2012). "Deep Sequencing of Plant and Animal DNA Contained within Traditional Chinese Medicines Reveals Legality Issues and Health Safety Concerns". PLoS Genetics. 8 (4): e1002657. doi:10.1371/journal.pgen.1002657. PMC 3325194. PMID 22511890. ^ Tyler, VE; Robbers JE (1999). Tyler's Herbs of Choice: The Therapeutic Use of Phytomedicinals. Routledge. pp. 6–8. ISBN 978-0789001597. ^ Tyler, VE (31 August 1999). "False Tenets of Paraherbalism". Quackwatch. Retrieved 28 April 2012. ^ "Traditional medicine, Factsheet No. 134". World Health Organization. May 2003. ^ Moerman, Daniel E. (1997). "Ethnobotany in North America". In Selin, Helaine (ed.). Encyclopaedia of the History of Science, Technology, and Medicine in Non-Western Cultures. Springer. p. 321. ISBN 9780792340669. ^ Liao, Hui; Banbury, Linda K.; Leach, David N. (2008). "Antioxidant activity of 45 Chinese herbs and the relationship with their TCM characteristics". Evidence-Based Complementary and Alternative Medicine. 5 (4): 429–34. doi:10.1093/ecam/nem054. PMC 2586310. PMID 18955214. ^ Boxin Ou; Dejian Huang; Maureen Hampsch-Woodill & Judith A. Flanagan (2003). "When east meets west: the relationship between yin-yang and antioxidation-oxidation". The FASEB Journal. 17 (2): 127–29. CiteSeerX 10.1.1.319.417. doi:10.1096/fj.02-0527hyp. PMID 12554690. ^ Kala, Chandra Prakash (2006). "Preserving Ayurvedic herbal formulations by Vaidyas: The traditional healers of the Uttaranchal Himalaya region in India". HerbalGram. 70: 42–50. ^ Kala, Chandra Prakash (2005). "Health traditions of Buddhist community and role of amchis in trans-Himalayan region of India". Current Science. 89 (8): 1331–38. ^ Kala, Chandra Prakash (2003). Medicinal plants of Indian trans-Himalaya. Dehradun: Bishen Singh Mahendra Pal Singh. p. 200. ^ Indira Permanasari; Aryo Wisanggeni (21 February 2012). "Jejak Mataram Kuno di Sindoro". Ekspedisi Cincin Api Kompas (in Indonesian). Archived from the original on 2 March 2012. Retrieved 4 November 2015. ^ a b c "Jamu dan Lulur, Rahasia Cantik Para Putri Keraton". Tribun Jogja (in Indonesian). 21 May 2013. Retrieved 4 November 2015. ^ a b Vickers, A; Zollman, C (16 October 1999). "Herbal medicine". British Medical Journal. 319 (7216): 1050–53. doi:10.1136/bmj.319.7216.1050. PMC 1116847. PMID 10521203. ^ Grassmann, J; Hippeli, Susanne; Elstner, Erich F (June – August 2002). "Plant's defence and its benefits for animals and medicine: role of phenolics and terpenoids in avoiding oxygen stress". Plant Physiology and Biochemistry. 40 (6–8): 471–78. doi:10.1016/S0981-9428(02)01395-5. ^ Huffman MA (May 2003). "Animal self-medication and ethno-medicine: exploration and exploitation of the medicinal properties of plants". Proc Nutr Soc (in Hindi). 62 (2): 371–81. doi:10.1079/PNS2003257. PMID 14506884. ^ a b Engel, Cindy (2002). Wild Health: How Animals Keep Themselves Well and What We Can Learn From Them. Houghton Mifflin. ISBN 978-0-618-07178-4. ^ Dybas, Raskin (2007). "Out of Africa: A Tale of Gorillas, Heart Disease... and a Swamp Plant". BioScience. 57 (5): 392–97. doi:10.1641/B570503. ^ Hutchings MR, Athanasiadou S, Kyriazakis I, Gordon IJ (May 2003). "Can animals use foraging behavior to combat parasites?". Proc Nutr Soc. 62 (2): 361–70. doi:10.1079/PNS2003243. PMID 14506883. Wikimedia Commons has media related to Herbalism. Aronson, Jeffrey K. (2008). Meyler's Side Effects of Herbal Medicines. Elsevier. ISBN 9780080932903. Braun, Lesley & Cohen, Marc (2007). Herbs and Natural Supplements: An Evidence-Based Guide. Elsevier. ISBN 9780729537964.